Inspiration. 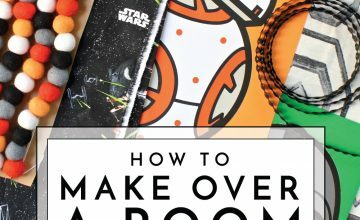 Having three bedrooms meant that my husband could have his “man cave” and I could have my craft room; AND I could make the room as girly and whimsical as I wanted. I found (and fell in love with) these fabrics from Waverly Sun’N’Shade line (Sidewalk Stripe, Flip Flops, Deco Dots – all Cancun color scheme). Again, not knowing what exactly I was going to do with them, I bought a bunch of each pattern. To date, I still have quite a bit of some fabrics left! Wall. 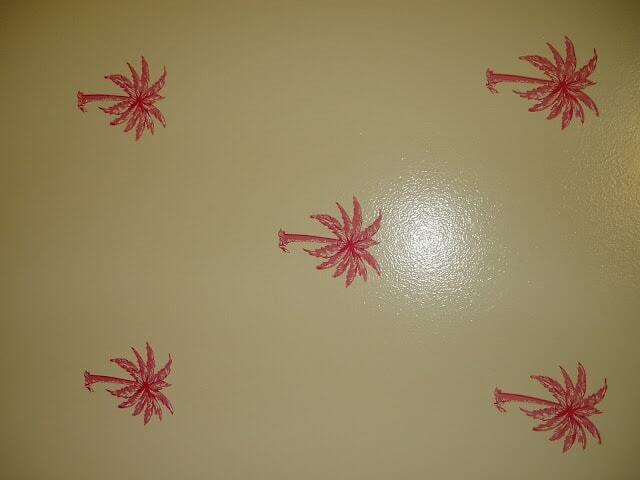 I purchased these hot pink palm tree wall decals from Pottery Barn Teen. 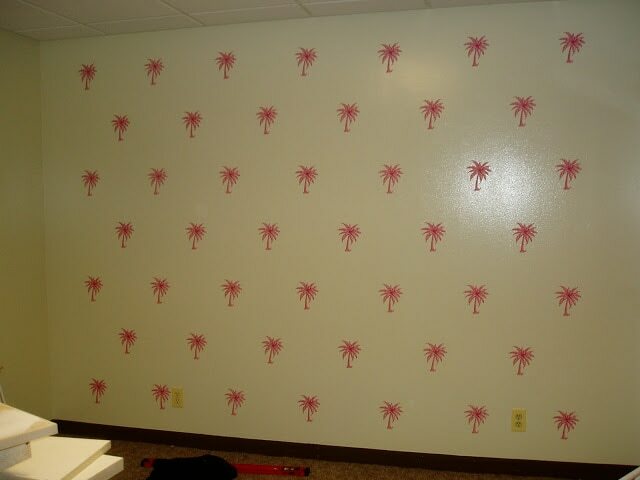 All I had to do was divide the wall into even sections, measure and mark out out my spots, and then adhere each tree with a damp sponge (this was before the rise of vinyl decals!). Again, this was a very simply process for a lot of impact. The best part of all, they came off VERY easy and the room didn’t require a paintbrush to return it to its original condition. Curtains. I distinctly remember making these curtains to mimic a picture I had seen in a BHG decorator magazine. The curtains featured double-sided patterns with a third fabric as “binding”; and the curtains were pinned open so you could see all three fabrics. Because I only had hooks to work with (not curtain rods), I simply made big, double-sided squares. I put the stripe on one side, polka dot on the other, and plain pink for the edges. To hang the curtains, I found curtain hooks that were attached to brightly colored cloths pins (awesome find – I bought 5 colors!). 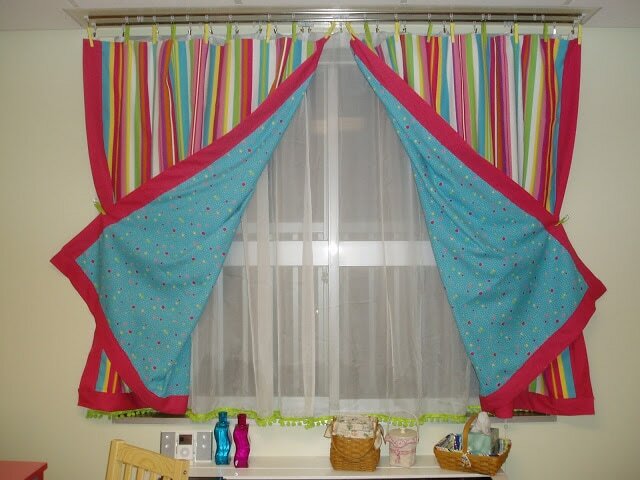 They added just the right amount of fun and flexibility, while still keeping my curtains up! Underneath the curtains, I hung two leftover white curtain sheers hemmed to the window’s height. I trimmed each panel with lime green pom pom trim! Area Rug. Again, (I can’t say this enough! ), all of my decorations were born out of what I could find in the Japanese markets! These rugs were 2 smaller “rugs” that were actually more like heavy blankets than rugs. 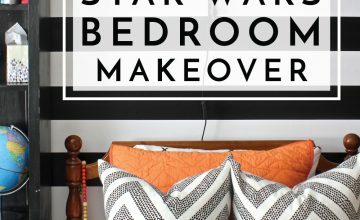 I hated the brown, ugly carpets of our housing unit so I was willing to try anything to brighten the room and cover them up! These two small rugs were $20 a piece, and I “bound” them using my plain turquoise indoor/outdoor fabric. This worked great to make them one cohesive unit, and added a fun touch of color to the floors. Too bad my sewing skills were a little weak to make these really durrible; but thankfully this was a “low traffic” room and it didn’t really matter. Craft Cart. Oh the craft cart! The bane of my existence yet my most favorite piece of all!! I bought this kitchen cart at a thrift store in Okinawa that “featured” American items (read: American cast offs marked up really high!). The stools were sold with it, but they were definitely NOT part of the same set, as they were too high to sit properly at the island. I bought them together for around $100 – way too much – but I was desperate for something like this and it was so hard to find similar items in Okinawa! 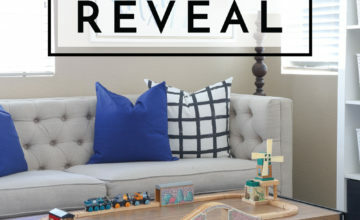 I knew I wanted to paint them a fun combination of colors, but having never repainted furniture before and not having a “Home Depot” to go ask questions, I just figured it out as I went. I bought a small hand-held electric sander and a bunch of brightly colored wall paints. Had I known about all-bonding primer, this project would have been “cake.” Instead, I spent HOURS sanding off the tightly adhered veneer covering the entire surface of this cart. 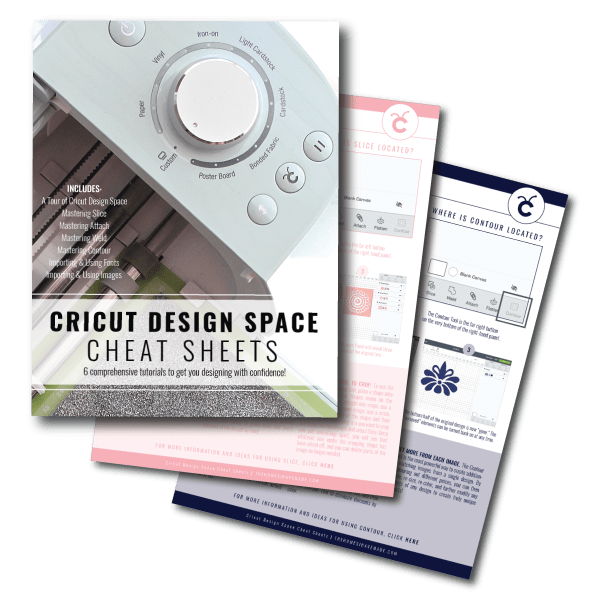 And worst of all – I did it INSIDE my apartment! Since I didn’t have a garage or yard to work in (we lived in an apartment building), I didn’t have a place I could keep it setup as I worked on it except inside my home. When we moved out, I was STILL finding saw dust in unfortunate places! Once sanded, however, this piece was SO much fun. I masked off certain areas as I went. I painted all the side surfaces hot pink, all the tops light pink, and all the remaining surfaces turquoise. I then removed the broken drawer, had a piece of wood cut to fit the opening, and covered it with batting and my coordinating stripe fabric. 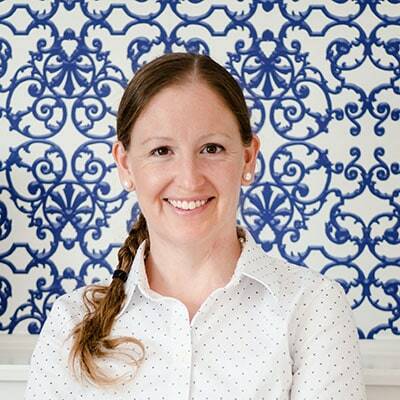 Loved, loved, loved this piece – I still regret selling it when we moved! Bar Stools. These were much easier to re-do than the cart and I just love how they turned out! I used brightly colored spray paint both in yellow and green. I painted the green first, then masked off the ends and (very carefully) sprayed the yellow. 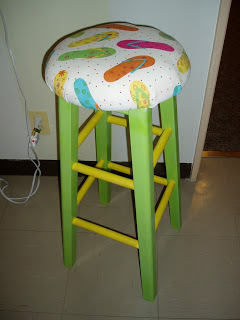 Instead of removing the seats of the stool, I just stapled batting and my flip flop fabric to the underside of the seat with a staple gun. 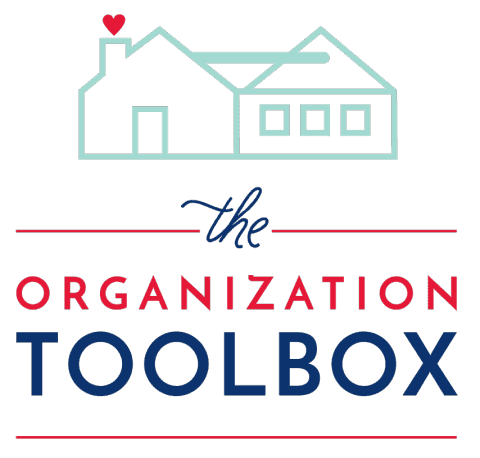 These were so simple and so adorable – I just wish the whole thing functioned better. Again, because the stools didn’t come with the cart, they were actually awkward to sit at and do anything on the cart. Lesson learned: don’t waste money on items that don’t function because you wont use them no matter how cute they are! 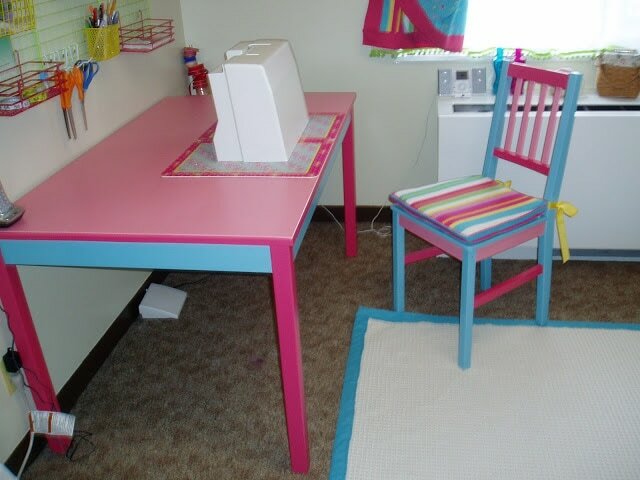 Sewing Table & Chair. This table and chairs set was purchased unfinished (YES! No sanding needed!) from a Japanese hardware store. I distinctly remembering buying these while my husband was deployed. 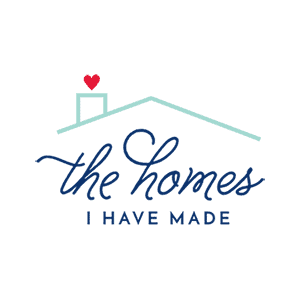 They were more expensive than I wanted (and we REALLY didn’t need them), but I needed a project, I needed a sewing table, AND they were unfinished – sold! 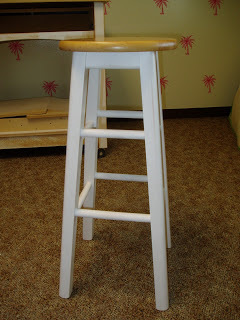 (The table came with 2 chairs – I painted the other one for the family room but I can’t find the picture!). 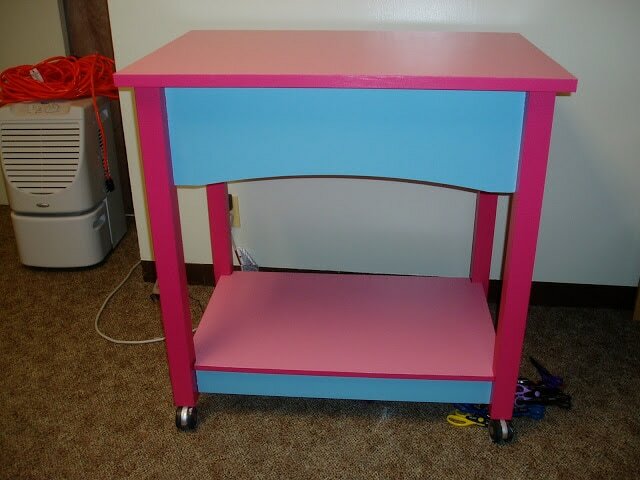 Like the craft cart, I painted the verticle surfaces hot pink, the top surface light pink, and the other edges turquoise. The chair was also painted the same way! 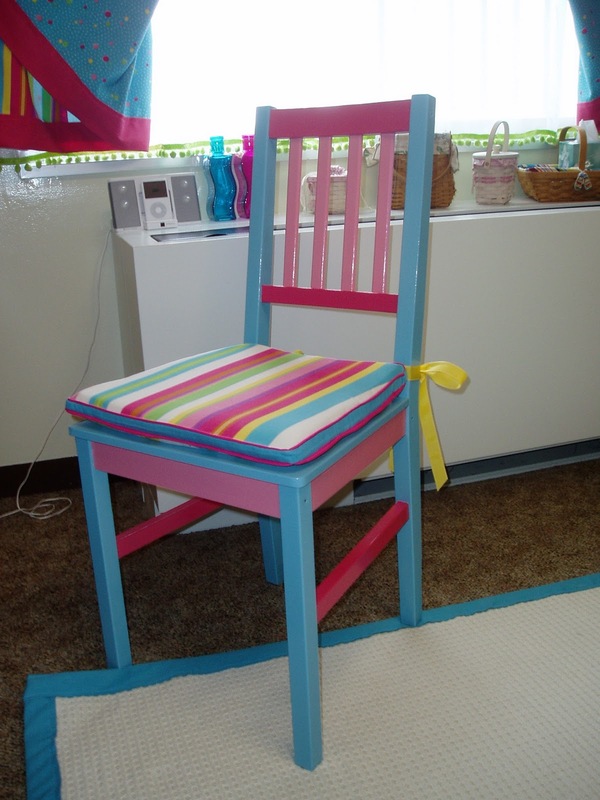 I made a chair cushion with ribbon ties out of my coordinating stripe fabric. I also found these two random place-mats at the Pottery Barn Outlet. Per my usual, I wasn’t sure what I was going to do with them, but they matched, so I bought them! They actually were perfect to place my sewing machine on so the painted surface of the table wasn’t damaged. Wall Organization. These racks and baskets were all from the Y100 Store (read: Japanese dollar store!). Everything was black and white, and I used my spray paints to give them some color. 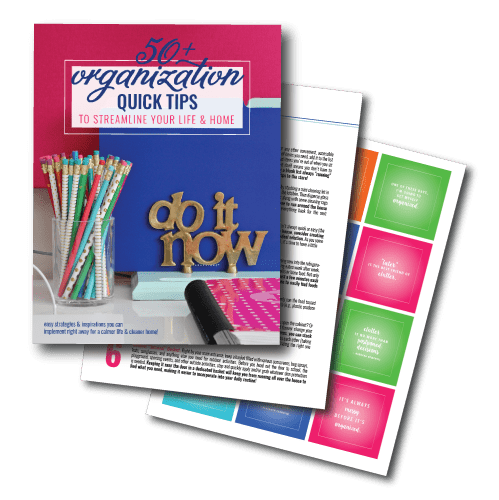 This was a super quick, super cheep, and super functional way to organize all my sewing/craft supplies that I needed at the ready. Craft Closet. 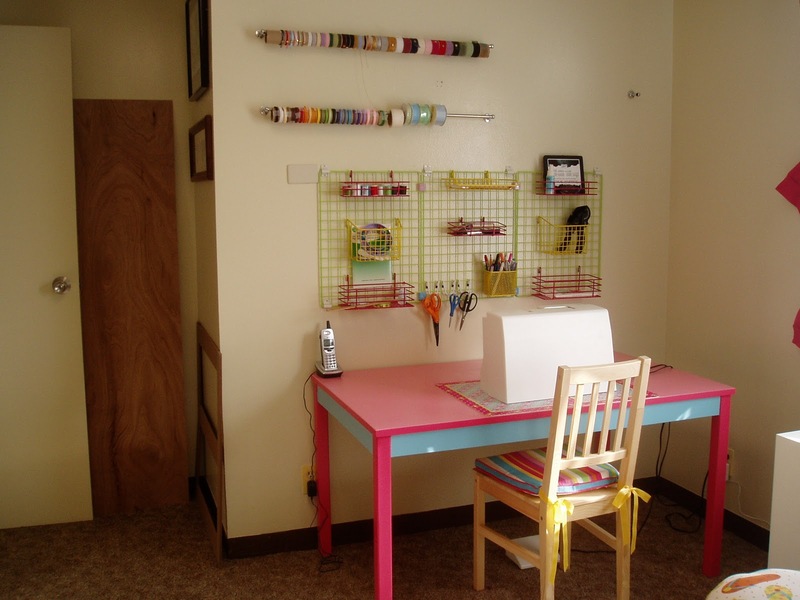 As this was early on in my crafting days, all of my craft supplies fit into one closet (not anymore)! I bought these modular shelves at a Japanese furniture store (and figured out how to assemble them using pictures only!). All the plastic bins and plastic binders were from the Y100 Store as well (best store for organization supplies EVER!). Before leaving, I stocked up on the square plastic bins (they have flip top lids) – I cleaned out the island’s supply! Labels for the bins were made using Stampin’Up label stamps on adhesive paper, then cut out with scissors.